NBC 7 Steven Luke breaks down the new law going into effect in 2019 that will limit the types of pets retail stores can sell in California. Retail pet stores in California will only be able to sell kittens, rabbits, and puppies if they come from a rescue organization after a new state law goes into effect Tuesday. With AB 485, California became the first state to implement such strict new rules on pet stores. Retailers are banned from selling live dogs, cats or rabbits unless the animal was obtained from a public animal control agency or shelter, humane society group, society for the prevention of cruelty to animals shelter or a rescue group that’s in a cooperative agreement with at least one private or public shelter. Suna and Mitch Kentdotson were visiting the SD Humane Society to adopt a new kitten on Friday. They said they'd like to see the state restrict neglectful breeders from profiting off the sale of puppies and kittens. “I think it’s better to rescue these animals instead of having like a puppy mill or something like that where these animals are raised super inhumanely," Suna Kentdotson said. “It takes the emphasis off the profit of animals and puts the emphasis back on caring for and getting these cats and dogs a good home," Mitch Kentdotson said. San Diego County has a few retail pet stores left, including Broadway Puppies in Escondido, which has a sister store in National City. According to the company’s website, they only use responsible licensed breeders. Come Tuesday, they'll only be able to sell pets from shelters. The Humane Society said it hasn't been contacted by any local retail pet stores inquiring about the purchase of its animals. But even if they do contact the group, the Humane Society isn't sure it would partner with the stores. "We're not prepared to do that ourselves, because we have a fairly robust adoption program," MacKinnon said. 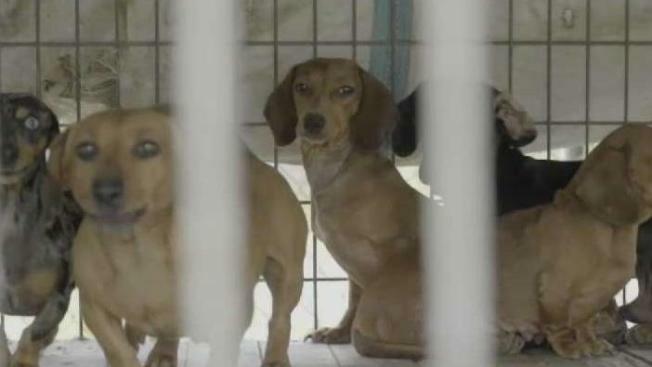 The organization sent letters to all local stores reminding them of the new law, which does not impact the sale of dogs, cats, or rabbits direct from breeders. The San Diego Humane Society will be one of the local organizations monitoring retail pet stores to make sure they follow the new rules.